The leading Global Equity Crowdfunding Company, OurCrowd, is preparing for its fourth annual Investor Summit at the Jerusalem Convention Center on 01 February. OurCrowd is on track to have more than 10,000 people registered, which will make the event one of the largest in the Middle East and one of the largest equity crowdfunding events to take place anywhere in the world. Well known multi-national corporations will once again be present like General Electric, Honda, DuPoint and Samsung along with entrepreneurs, investors, government officials and members of the press from around the world. In just over five years, CEO Jon Medved said OurCrowd has built a global network of more than 20,000 investors, entrepreneurs, corporations and venue capitalists. “From our unique position connecting this growing network, we’re able to bring the entire ecosystem together at the Summit and help drive the era of tech innovation, and find more ways to transform the world and how we live,” he added. The Jerusalem Mayor is thought to be one of seven candidates who would stand for the leadership of the Likud Party if Prime Minister Binyamin Netanyahu steps down, although Barkat says he still has not decided what he wants to do. According to Forbes magazine, Nir Barkat is worth around £100 million which if true, probably makes him the wealthiest Israeli politician, although he does not take a salary from the city of Jerusalem for the honor of being Mayor. 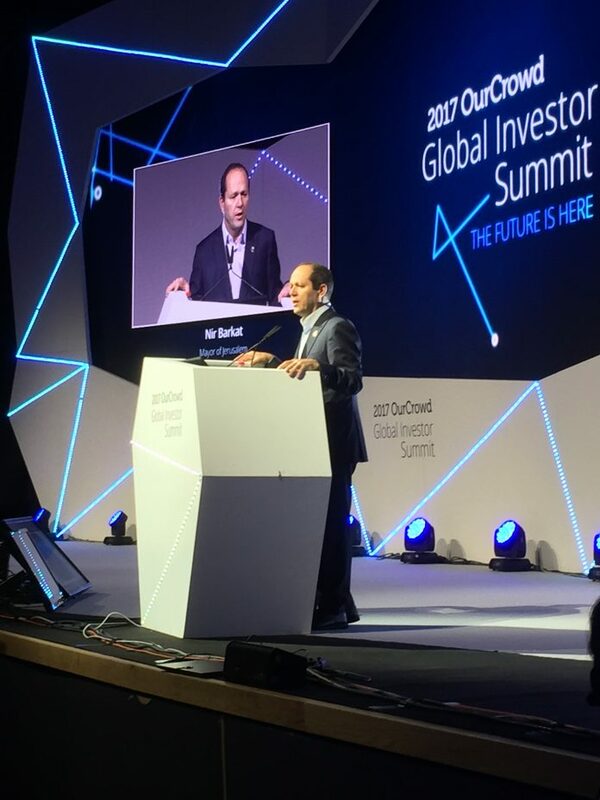 Barkat is expected to open the Summit on 1 February from the main stage inside the Jerusalem Conference Centre. Throughout the day, the main stage will hear first-person accounts of start-up tech changing the world, assisting law enforcement in the aftermath of the Las Vegas shooting, drone search and rescue after the hurricanes in Florida and Texas, helping rehabilitate spinal cord injuries, saving lives from medical errors, and much more. In addition, the car manufacturing giant Honda will host a robotics pavilion from the same main stage later in the day which will introduce their latest technologies.